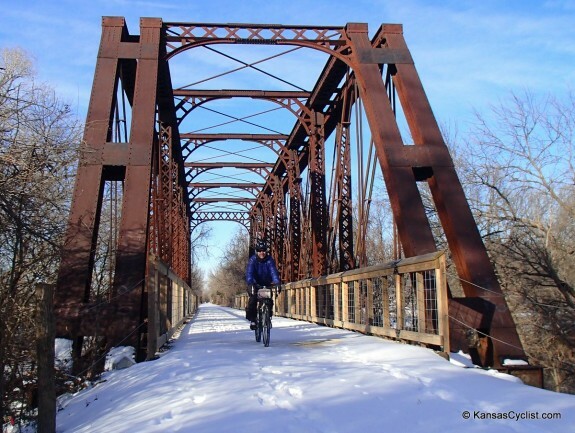 The Sunflower Cycling News is a periodic publication of Kansas Cyclist, featuring a compendium of hand-picked bicycling-related news items from Kansas and neighboring states. The following is a recap of recent bicycling news from the region, as well as a look ahead to upcoming rides, races, and bicycling events coming up. There is a petition to designate the American Discovery Trail as the “first coast to coast trail in the National Trails System”. The American Discovery Trail passes right through the heart of Kansas. Sunflower Sunflower Outdoor & Bike Shop is holding a Sunflower Kanza Clinic on January 9th at 7pm at their store in Lawrence. — In Jonesboro, Arkansas, a new trail is planned for Craighead Forest Park. – A man in North little Rock, Arkansas is thanking three strangers who helped him after he crashed his bike. — Vail, Colorado is celebrating its status in the Bicycle Friendly Community rankings, after moving up from bronze to silver. — Fort Collins, Colorado bicycling columnist Rick Price says We need to unlearn the outdated ‘far to the right’ rule. — A Kansas City, Missouri man’s bicycle was destroyed when the bus he was riding on collided with a van, and he’s waiting for the insurance company to settle up. In the meantime, he was without transportation, until a new bike was donated by television viewers who want to “pay it forward”. — A letter to the editor in Kansas City, Missouri questions “whether marked bicycle lanes along city roads offer bicyclists a safe, legal right-of-way”, while apparently not understanding how they work. — Bellevue, Nebraska is considering banning bicycles from their Missouri River bridge, saying that impatient motorists are creating a safety hazard. — There’s a new bicycle club in Scotts Bluff, Nebraska. The local newspaper says Bike-friendly streets would be good for our health. — In Oklahoma, a travelogue, with fine photos, from New Years Day Ride 2014. — Oklahoma City has the state’s first buffered bike lane. We’ve had our share of frigid weather, but now that that’s over and done with (right! ), get out there and ride. This is me enjoying the Southwind Rail Trail. Temperatures in the 30s, plus a couple inches of snow on the ground, make for excellent riding conditions! If you have a news item or upcoming event you’d like to share, please contact Kansas Cyclist with details.